Adaptable to suit a multitude of display needs, our exclusive Slatwall Merchandiser H-Unit is the perfect addition to your showroom. This freestanding slatwall display features a matte silver frame, slotted frame uprights, maple slatwall panels with aluminum inserts, and four casters (two locking). 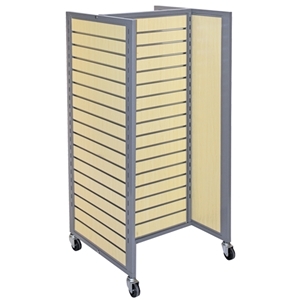 This merchandising unit is easy to assemble, very sturdy, mobile and versatile. Works in conjunction with slatwall accessories which can be purchased separately.